“The bizarre, yet utterly hypnotic love child of David Lynch and Errol Morris […] easily one of the most unique and satisfying documentaries of the year. Filmmaker Jon Foy and Philadelphia-based artist and musician Justin Duerr began planning a documentary film about the Toynbee Tiles in 2000. Five years later, they began filming their investigation of these strange street plaques embedded in the asphalt of major U.S. and South American urban intersections that had held Duerr’s fascination for over a decade. Having appeared on hundreds of reported examples from the mid-1980s to present, the cryptic four-line message of the Toynbee Tiles read: “Toynbee Idea / In Kubrick’s 2001 / Resurrect Dead / On Planet Jupiter”. While the text on the plaques was clear enough, neither Duerr nor the numerous media outlets that had documented the phenomenon knew what these tiles meant, how or why they were installed, or who was responsible for them. Duerr’s interest in the tiles began in 1994, when he moved from rural Pennsylvania to Philadelphia and began noticing them while working as a foot courier in the city’s business district. He documented dozens of tiles downtown, and was struck by how little attention the bizarre phenomenon received from other pedestrians. He was shocked when, several years later, he discovered an obscure website on the Internet documenting tile sightings in other cities like New York, Baltimore, St. Louis and Boston, which he would later visit; soon, tile sightings soon appeared as far away as Buenos Aires and Santiago. Despite this prolifacy, Duerr could find no answers as to what the texts meant or who was responsible for them, although marginal clues towards the artist’s identity slowly began to mount. In 2000, his obsession was amplified by a near run-in with the tiler when Duerr found a freshly laid tile in front of a local convenience store late at night. Having missed the tiler by minutes, Duerr vowed to definitively solve the mystery of the Toynbee Tiles.Teaming up with local Toynbee Tile fanatics Steve Weinik and Colin Smith, Duerr began his quest with few clues towards the tiler’s identity. The investigation led the team through a series of strange and unexpected turns from the discovery of a Jupiter colonization organization to the David Mamet play “4 a.m.” and a TV news hijacker with a cryptic message. Along the way, the team met with the eccentric residents in the deepest reaches of South Philadelphia and dedicated shortwave radio buffs for clues and guidance. As the picture of the Toynbee Tiles’ narrative slowly entered into focus, Duerr was shocked by the answers he was uncovering and his unexpected emotional connection to the elusive tiler. An artfully crafted documentary, Resurrect Dead: The Mystery of the Toynbee Tiles is both an account of Duerr’s own obsession and a meditation on the broadly defined drive towards cathartic realization in the face of towering obscurity. The information age has seen few mysteries as impenetrable as that of the Toynbee Tiles, and the film champions the underdog accomplishments of these unlikely investigators. The documentary creates an atmosphere of magical realism as the unexpected pieces of this complex puzzle click into place. 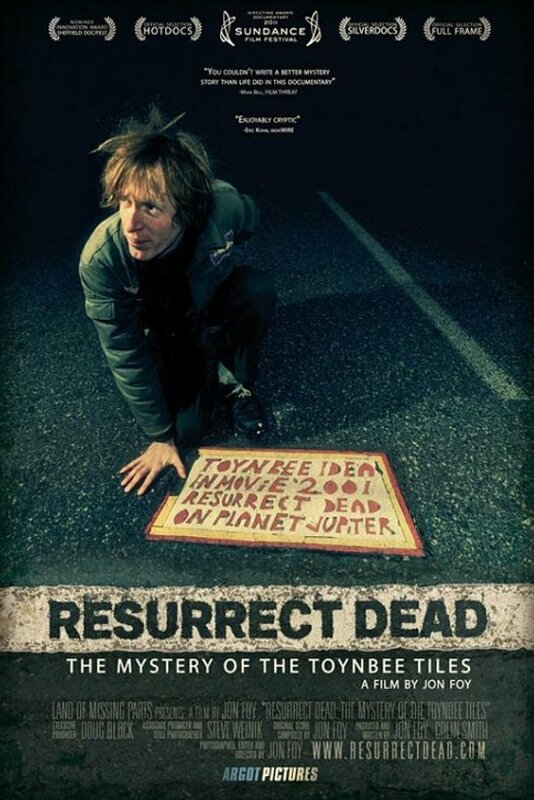 Resurrect Dead: The Mystery of the Toynbee Tiles is a Land of Missing Parts production. The film is directed, edited, photographed and scored by Jon Foy. It is written and produced by Jon Foy and Colin Smith, and executive produced by Doug Block. Filmmaker in Attendance: Q&A to follow the film. Filmmaker and musical composer Jon Foy started planning his documentary about the mysterious Toynbee tiles with artist Justin Duerr a decade ago, and began filming in 2005 after dropping out of film school in Austin, TX. While working on the film, the Philadelphia native sustained himself by cleaning houses and participating in medical research studies. A seasoned rock musician, Foy taught himself the art of film score composition for Resurrect Dead: The Mystery of the Toynbee Tiles, and also scored 2008’s The Chinese Room. Resurrect Dead is his directorial debut.